Not even sure how many people follow this blog anymore considering I have been on a bit of a hiatus. I want to let you know who ever you are that are still with me. I had a c section July 19th, 2013 and had some complications, in between, dr. Visits, trying two keep up with two little boys under 3, working on my B.A, and writing something had to give, which was unfortunately this blog. Anyhow, I’m back, with a new perspective and some new ideas. One thing on my to do list for the new year. Get organized. I thought this was a good way to do that while saving money and that oh so precious thing we all would like more of….time. So today I spent a few hours cooking make ahead meals. Lately I’ve realized we spend way too much on convenience foods, not only fast food, but packaged food. This can add up fast. Especially with two little ones. Here’s a way to cut down on your grocery budget. Try to avoid prepared meals and produce. You can prepare it youself for way less. This took about 3 hours but I felt a sense of accomplishment. Well I cleaned my freezer too I can count that too right? First I did a batch of oatmeal, (which is pretty much pennies a serving) just plain old fashioned oats. 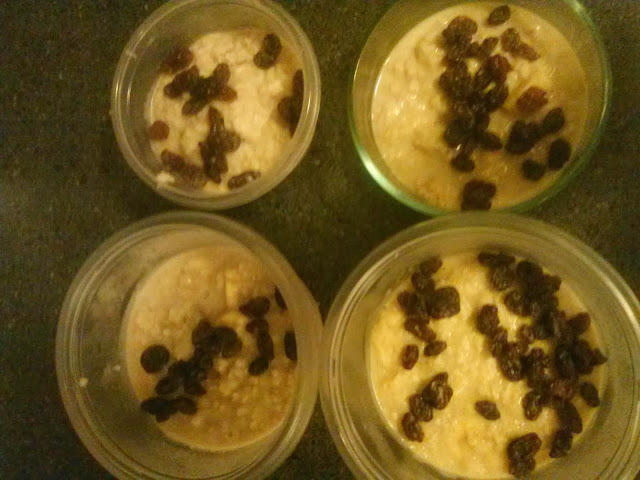 Added Brown sugar, butter, milk, and raisins to stir in. I only made 4 bowls since I might be the only one eating it besides my lil guy. My husband and oldest are picky and only want eggs and bacon or sausage for breakfast. 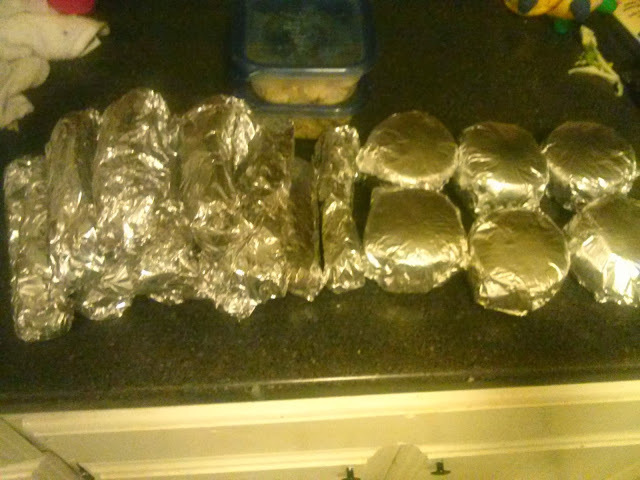 Then I made 14 breakfast burritos with egg, cheese, hashbrowns and sausage scramble. I figured this would be about .50 a piece to make from scratch. The night before I made a white bean and ham soup and froze for individual lunches. About .75 a serving. Froze that in four containers. Then I made pancakes and french toast. Made a double batch of both for about 10 servings of each. Total cost per serving abt .50. That night for dinner I made a mexican casserole. 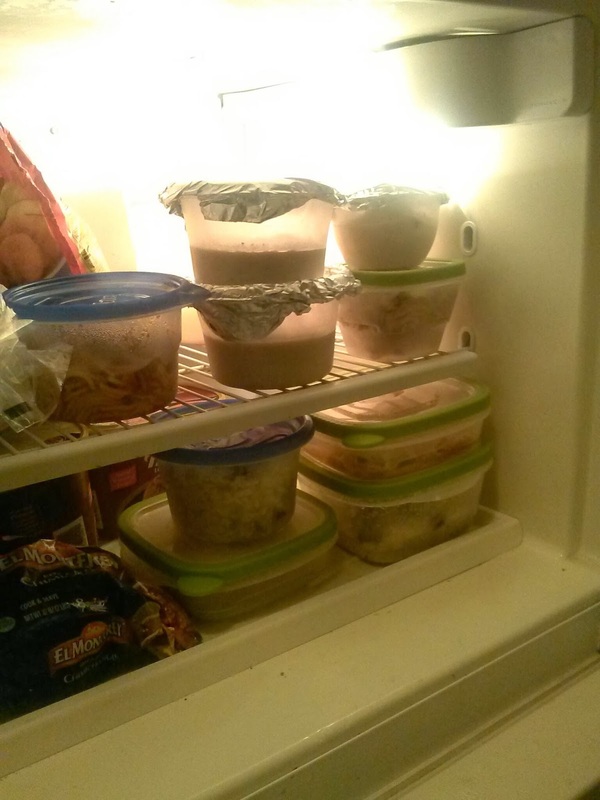 Froze the rest in individual containers for lunches. Abt .75 a serving. By taking a little time out of each week, or even month you can do make ahead meals and avoid fast food and eating out. Your budget will thank u. You could save about $100-200 a month just meal planning and thinking ahead. Or just make a double batch of whatever your’re cooking for dinner and freeze the other half could save you time and money. This has been so helpful for me lately with a 5 month old and a three year old that have me going non stop. Previous postSafeway Catalina: Spend $40.00 on Formula, Wipes and Diapers, Receive $10.00 Catalina! Next postHow To Make Homemade Baby Wipes – Just 6 Ingredients!